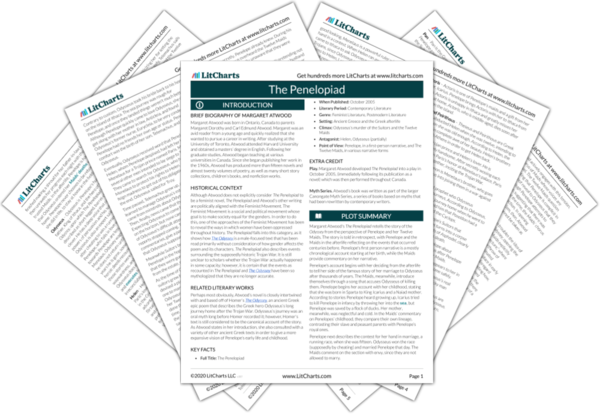 Instant downloads of all 942 LitChart PDFs (including The Penelopiad). 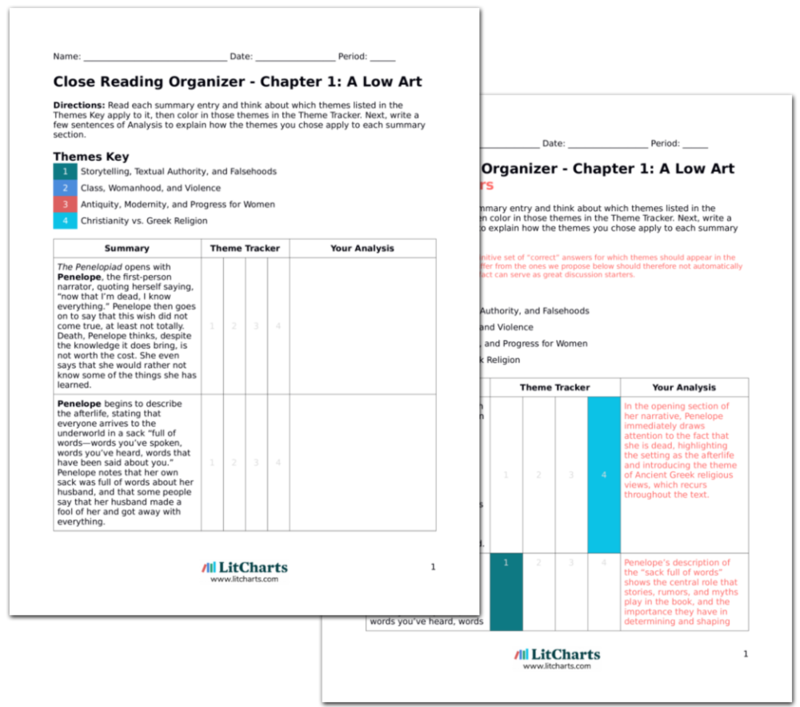 LitCharts assigns a color and icon to each theme in The Penelopiad, which you can use to track the themes throughout the work. Penelope opens Chapter 6, which continues in her first-person narrative, by saying that her marriage was arranged. Most marriages, she notes, were arranged at the time. According to the old rules of her day, only “important people” got married, because the point of marriage was to transfer inheritances. Other people had love affairs, sometimes even with gods, but did not actually get married. When goddesses had affairs with mortals, the man often ended up dead. In this section, Penelope begins outlining the cultural customs surrounding marriage. She emphasizes the fact that marriage was largely a means of exchanging money and status. In the Ancient Greek system, women were used as vessels to transfer inheritances and titles, trafficked as a kind of human currency. Penelope’s commentary on the gods shows how their dispositions were very different from the Christian God. She also accounts for their absence in the modern world. Penelope returns to the subject of marriages, stating that marriages were for having children, and having children was for passing down inheritances and forging alliances. Often men would kill their enemies’ babies after killing them or send them far away so that they would not be killed by them later. Daughters, Penelope notes, were only for breeding grandsons. It was important to have lots of men in the family to go to war. Hence, Penelope needed to marry. Again, Penelope emphasizes how marriages were not love matches, but rather were strategic means of moving money and making allies. Penelope also reveals that the women were used in marriage primarily for reproductive purposes, as their bodies were not considered their own or valuable until harnessed for the purposes of men. At Icarius’s court, they maintained the custom of having physical contests to determine who would marry Penelope. The winner of the contest was then expected to live at Icarius’s palace. Through the marriage, the man would become wealthy. Penelope notes a key difference between her marriage and later ones: while in later marriage systems the wife moved to the husband, in Ancient Greece (at least at this point) husbands were the ones who moved. 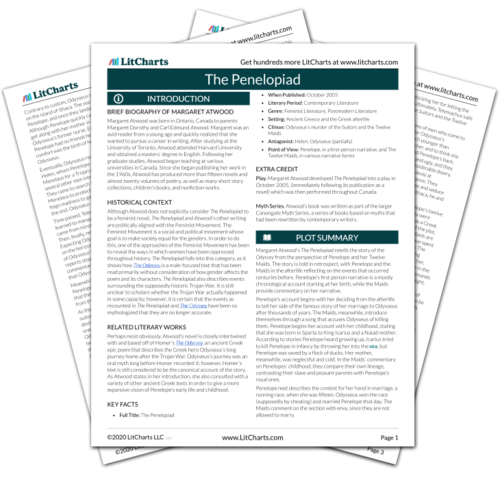 Get the entire The Penelopiad LitChart as a printable PDF. Penelope’s description of modern museums and gift shops is a humorous deviation from her discussion of marriage. It also serves to remind the reader that what is “normal” is culturally relative: what seems bizarre to Penelope is totally normal to us, and vice versa. The ancient customs required the treasure to stay in the bride’s family’s palace. Penelope thinks that this custom is why, after Icarius tried to throw her into the sea, he became so attached to her. Penelope then questions again why he tried to kill her, noting that every time she sees him in the afterlife, he hurries away from her. Penelope thinks maybe she was a failed sacrifice to Poseidon, the sea god. Penelope again shows how women were used and exploited as monetary vessels when she describes how she believes that, after trying to kill her, her father clung to her in order to try to keep her dowry at his palace. Penelope’s relationship to her father is financial, not loving. Penelope then describes herself as a girl of fifteen, looking out her window at the young men getting ready to compete to marry her. She peeks out from behind her veil through the window quickly, so the men cannot see her unveiled face. She has been made up as beautifully as possible, but she still feels shy. Below, the men laugh and joke. Penelope thinks that it’s not her that the men want, but the treasure they would gain in marrying her. No man, she thinks, would die for love of her. As Penelope describes her preparations for marriage, she notes her preoccupation with not letting the men see her face, suggesting that Ancient Greece had intense norms surrounding female modesty. Meanwhile, Penelope’s understanding of the monetary underpinnings of the Greek marriage system leaves her self-esteem low. This prediction turns out to be true. Helen, on the other hand, loved to make man grovel and feel miserable out of love and desire for her and then break their hearts. Though Helen was prettier, Penelope was kinder than Helen, and cleverer. Penelope muses that men prefer their wives to be clever as long as they are some distance away from them, and that up close they prefer kindness. Again, and as she will do throughout the text, Penelope compares her good traits to Helen’s looks and comes out feeling bad about herself. Penelope continues to hate Helen personally for this, rather than blaming the social system that makes Penelope feel worthless because she is not the prettiest, and that ranks female qualities entirely based on how attractive they are to men. As Penelope continues to study the men from the window, she tries to figure out who each is and which one she prefers. Several maids accompany Penelope, since until she is married she is at risk of eloping or being kidnapped. The maids gossip, laugh, and joke, gaining information about the bachelors for Penelope. While the maids in this section are not the Maids that later become confidantes to Penelope, Atwood shows Penelope’s women servants to be a constant but also enforced source of female community for her. Penelope asks about one barrel-chested man below, and the maid tells her he is Odysseus, the son of a lesser King of provincial Ithaca. Odysseus is not considered a serious contender for Penelope, but he is known to be very smart, even potentially deceptive. Odysseus’s grandfather, Autolycus, was known to be the same way. Although marriage is a monetary system, Atwood suggests that Penelope’s attraction to Odysseus was genuine. Meanwhile, Odysseus’s reputation for lying and deceit is important, as it casts doubt on his later storytelling. Penelope wonders aloud how fast Odysseus can run, since the contest to marry her is a running race. One maid remarks that he probably cannot run very fast since his legs are so short. Another says he is not fast enough to catch Penelope, and makes a joke about Hermes and Odysseus being a thief. Several other maids join in with sexual jokes and innuendos. They all laugh. Meanwhile, Penelope is extremely embarrassed. The maids in Penelope’s apartment play by their own rules. Rather than acting demure and shyly respecting the male suitors, the maids objectify the suitors, turning the tables of a system that effectively transacts women like money. Their jokes show how speech can be an act of subversion. As Helen approaches Penelope, Penelope suggests ways in which Helen has changed her behavior in order to be more appealing to men. This shows how the gender system has profoundly affected Helen’s whole person. Helen states that she thinks Odysseus would make a good husband for Penelope, and that if she went to Ithaca with him her life would certainly be quiet. Helen then says meanly that Odysseus and Penelope are “two of a kind” since they both have short legs. The maids laugh and Penelope is upset, having never before thought of her legs as especially short. Helen, though, has a special talent for evaluating people’s looks—which ended up getting her in trouble when she left Menelaus for the much better looking Paris. Penelope has already clearly expressed her dislike for Helen, and it becomes obvious that her distaste is not unmerited. This section shows how Helen actively tries to tear down Penelope’s confidence through backhanded comments like this one about the size of her legs. Helen competes with Penelope, and in turn Penelope despises Helen. The maids look to Penelope to see what she will say in response, but Penelope is speechless. Helen tells Penelope not to worry, and that both she and Odysseus are supposedly clever, so Penelope will be able to understand the things that he says. Helen says she could not, so it is lucky that Odysseus did not win her, reminding Penelope that Odysseus had tried to win Helen’s hand in marriage first and had failed, and that Penelope is “only second prize.” Helen walks away, and the maids talk admiringly of her beauty and her clothing. Penelope starts to cry and goes to her bed to lie down. Penelope’s hurt is very apparent following Helen’s comments, showing how women as well as men perpetuate the damaging societal norms of objectifying women. Helen, in another compliment that is clearly backhanded, says that Penelope can at least keep up with Odysseus’s intellect. Helen’s tone makes it clear that intelligence is not something valued in women in Ancient Greek society. Because she was in bed, Penelope did not watch the race itself, which Odysseus won through cheating. Uncle Tyndareous helped Odysseus win by drugging the other contestants’ wine and giving Odysseus a performance-enhancing drug. Penelope remarks that in modern times this kind of manipulation has become “a tradition.” Penelope wonders why her uncle, who was not friends with Odysseus, helped him. Penelope’s commentary on the fact that drugging is now common in sporting events serves as another splash of humor in this chapter. It also draws parallels between ancient and modern times, suggesting that, in some ways, they are not actually as different as they seem. Penelope then recounts a rumor she heard that she “was the payment” for something Odysseus had done for Tyndareous during the competition for Helen’s marriage. Odysseus made the contestants swear to defend whichever man won Helen in case someone tried to take her away, which allowed her marriage to Menelaus to go smoothly. After his help, he made a deal with Tyndareous that he would get Penelope. When Penelope says that she was “the payment” in a deal between Odysseus and Tyndareous, she emphasizes again that women are trafficked as money. Moreover, she shows how women’s lives can be totally changed and uprooted as a result of men’s minor dealings and games. Penelope, though, has a different idea of what happened. She thinks that Tyndareous, who had to share the throne of Sparta with Icarius, wanted the throne for himself. Odysseus, rather than moving to Sparta, would take Penelope away to Ithaca, keeping Penelope’s sons from the Spartan throne. Again Penelope finds herself in the middle of a series of power struggles between men, power struggles in which she stands to gain little other than a husband and a new life far away from Sparta. Regardless of why, Odysseus won. Penelope remembers Helen smiling during the marriage, happy that Penelope was moving to Ithaca, which she considered a “dreary backwater.” Penelope felt dizzy during the whole ceremony, only looking at Odysseus’s legs and thinking how short they were. It made her want to laugh, and Penelope reminds the reader that, at the time of her marriage, she was only fifteen. Helen’s happiness that Penelope is moving to a “dreary backwater” again highlights the competition between the two women. Meanwhile, Penelope’s reminder that she was only fifteen at the time of her marriage shows how the gender and marriage system affects children as well as adult women. Churchill, Katherine. "The Penelopiad Chapter 6: My Marriage." LitCharts. LitCharts LLC, 18 Jun 2017. Web. 22 Apr 2019. Churchill, Katherine. "The Penelopiad Chapter 6: My Marriage." LitCharts LLC, June 18, 2017. Retrieved April 22, 2019. https://www.litcharts.com/lit/the-penelopiad/chapter-6-my-marriage.